Museums tend to collect what fits in a glass box, and lose sight of such intangible effects. In particular, Oceanic artists rely on and revere natural materials, many of which may decay or dissolve but are no less valued. In a new installation, Allyce Wood, a Seattle artist, was commissioned to reunite selections from the museum’s Oceanic collection with visual elements of artistic environments that were abandoned. Terror is triggered by the sight of moving shields in Asmat fields. Bursting out of a dense forest, the shields signal oncoming combatants as they dodge and lunge forward, leaping swiftly and making zigzag movements to fend off opponents. In a region of lush verdant growth, the shields presented as “billboards” to announce that warfare was to begin. 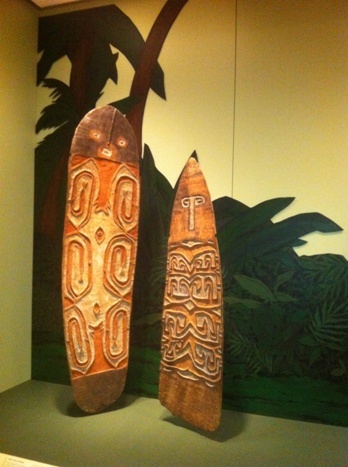 War Shields (Jamasji), early 20th century, Irian Jaya, New Guinea, Asmat people, wood, lime, clay and fiber, Gift of Tom and Vicki Griffin, 2004.237, and Gift of Mark Groudine and Cynthia Putnam, 94.113 (right), installed with backdrop by Allyce Wood. Now on view in the NEW Oceanic Art Gallery, third floor, SAM downtown.